I didn’t go to bed until after 1:30 am on Tuesday morning, so I slept in until 10:30. Dustin and I didn’t really have any plans, and by the time we decided to go to the beach, we realized it was too late. Simon had mentioned that we could see Rock of Ages, since they were holding a screening at Warner Brothers (where he works). He lives just a few miles from work and we headed down there around 1:30 for the 2:00 screening. Rock of Ages is somewhat of a musical, so I went in thinking it wasn’t going to be my cup of tea. I was a little surprised and overall thought it was pretty good. I like ’70s and ’80s rock music, and there are also some laughs thrown in there, which is always good. The screening was over by 4:15, and we went to In-N-Out Burger afterwards. With that name you’d think it would be quick, but I was a little disappointed. We went inside to order, but got it to go, because we were in a hurry. There wasn’t a line when we got there, and it took 13 minutes from the time we ordered to when we left. I’m an impatient person to begin with, so maybe I’m a little biased, but that just seems slow. They had at least nine (I counted them) people working behind the counter so I was expecting a pretty quick turnaround, but no dice. The burger was good, and so was the strawberry shake I got, but Dustin and I agreed the fries left something to be desired. I saw the fries go right from the potato, through the slicer, and into the frier, so I was expecting something amazing. The fact that they were just luke warm by the time we ate them back at Simon’s might be to blame as well. I was planning on meeting Adam McCalvy, the Brewers beat writer, before the game on Tuesday. 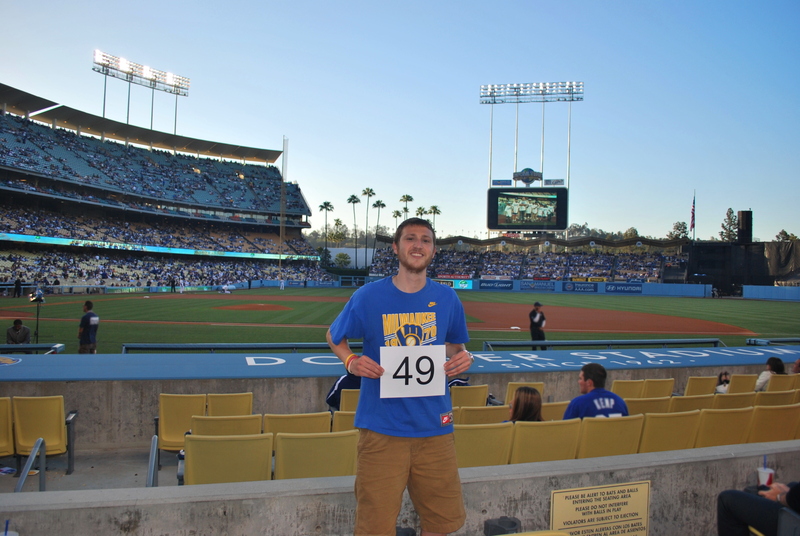 Due to LA rush hour traffic Dustin and I weren’t parked until 6:13, and didn’t get inside Dodger Stadium until 6:30. I texted Adam and he said not to worry, and that he got us batting practice field passes for Wednesday’s game. Sweet! It was “The Infield” bobble head day, and it was almost a full house. The announced paid attendance was 51,137, but there were a lot of people who got their bobbleheads and just left. There are Brewers fans who do this as well, and I don’t understand it. The only reason the bobble head means something to you is because of the game of baseball, so you must enjoy it at least a little, right? 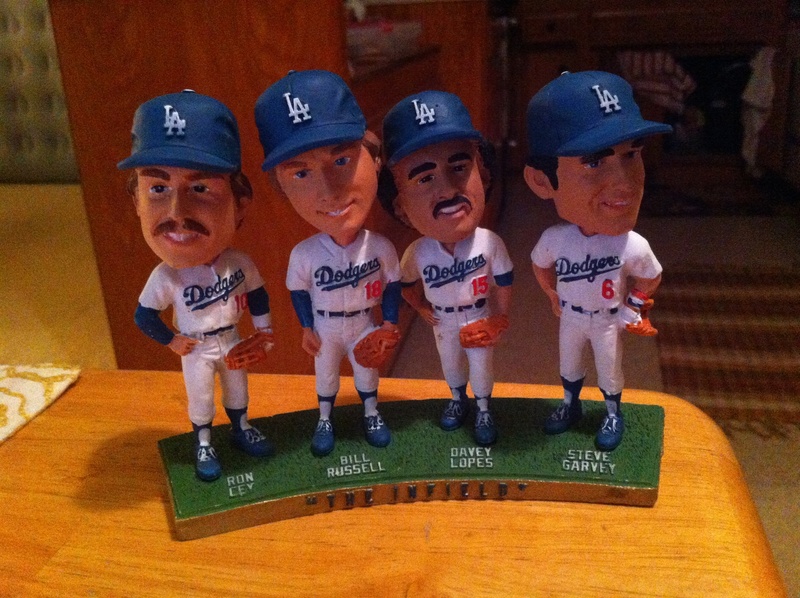 The bobble head commemorates the Dodger’s infield of Ron Cey, Bill Russell, Davey Lopes (former Brewers manager), and Steve Garvey, who played together for 8-plus seasons, with their first appearance together in June of 1973. I’m debating keeping the bobble head just because I think it’s cool, but I’m not sure I can fit it in my suitcase. Luckily the upper deck roof was about to hide the sun, otherwise this would’ve gotten pretty annoying. 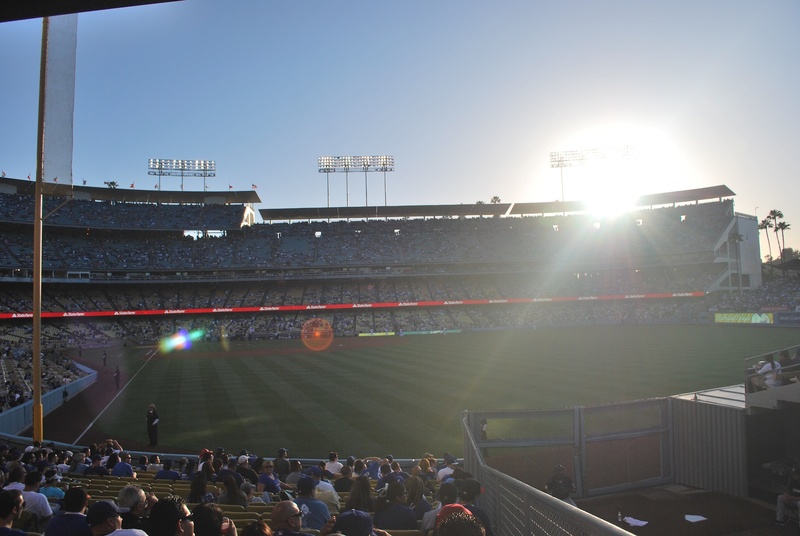 Monday’s game was at 5:10, so the people in these seats had to deal with the sun for the first two hours, no thank you. 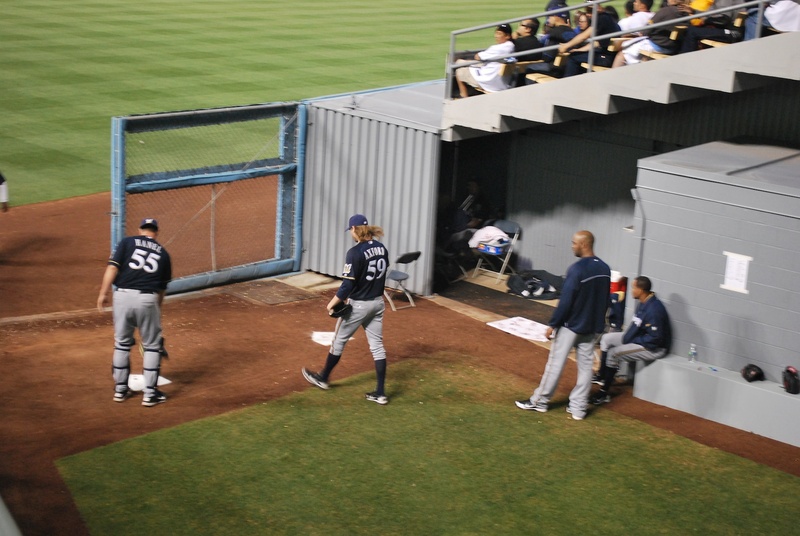 Axford had to face the meat of the order, and he had a nine pitch battle with Matt Kemp to lead off the bottom of the ninth. Kemp won and ripped a double to left center, and the Dodger’s win expectancy jumped from 17.4% to 41.7% (I looked at fangraphs.com). The very next pitch Axford hit Andre Ethier in the back with a 97 mile-per-hour fastball, and just like that the Dodgers had the winning run on base. Jerry Hairston was next and after a ball and two failed bunt attempts he grounded into a 4-3 double play. Kemp moved to third on the play and the tying run was only 90 feet away. James Loney then grounded out to short, and the Brewers escaped with the win. 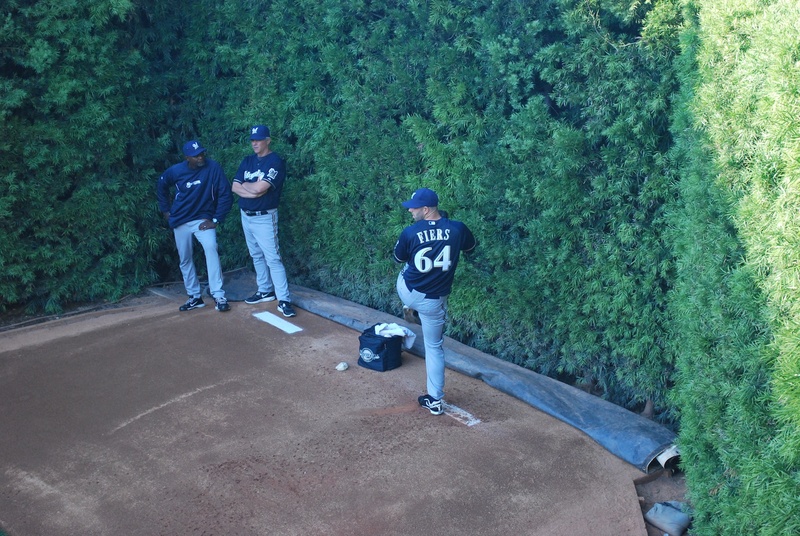 Final Score: Brewers 2 – Dodgers 1. I don’t know how they did it, but the Brewers have now won two consecutive games while recording a combined total of 9 hits. Yes, NINE hits over two games, and two wins to show for it. That is some impressive pitching and defense. Nicely done. Simon is going to give us a tour of Warner Brothers tomorrow, and then we’re going to hit up the Hollyhock house, which was designed by Frank Lloyd Wright, and built in 1919-1921. Dustin likes Frank Lloyd Wright and architecture, and so do I to some degree, so it should be fun.